Exercises for the Back Weak back muscles will cause us to have rounded shoulders, leaving us with a rounded upper back and causing our chests to collapse inwards, not very attractive. Here are just a few exercises to strengthen the back. Sit and adjust the pad on the machine so that it rests on top of tour thigh. Grab the bar with an overhand grip with your hands slightly wider than shoulder width. Lean back slightly, inhale keeping your chest lifted and shoulder blades down and back, exhale contract your lats to pull the bar down, pause and slowly return to the start. Source Lie on your back on a flat with your knees bent; hold a dumbbell over your chest, with your arms extended. Keep your elbows soft. Slowly lower the dumbbell in an arc behind your head. 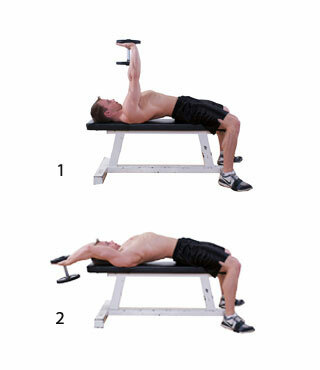 Contract your lats and bring the dumbbell back overhead to the starting position. One-Arm Bent-over Row dumbbell-row-one-arm Source Place your right hand and knee on the bench, maintain a flat back and you head should be inline with spine. Holding the dumbbell in the free hand, keeping the elbow close to the body, pull your arm up and back. Pause at the top for a few seconds and slowly lower to the start. Don’t slouch. :) Did you know……… Honey contains an enzyme that produces hydrogen peroxide which kills germs and it may reduce inflammation as well. See you later.